After a long contemplation of thought and ideas I decided to depart from Minneapolis, which is a long over due departure. Comparing most cultures I lived during my international travels—Minneapolis has been one of the most challenging. 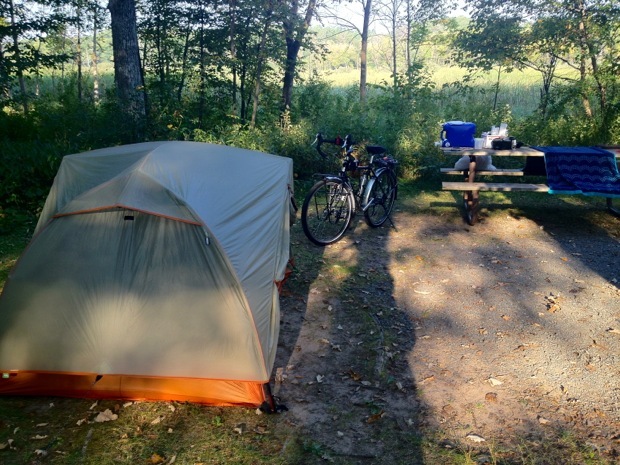 I decided to depart with my car and travel from campground to campground, despite having a strong desire to bicycle. I can always sell the car and extra gear and cycle anytime. I still have all my panniers and Long Haul Trucker. I have found several resources related to camping such as freecampsites.net, in addition to camp friendly states such as free camping in Colorado and New Mexico. 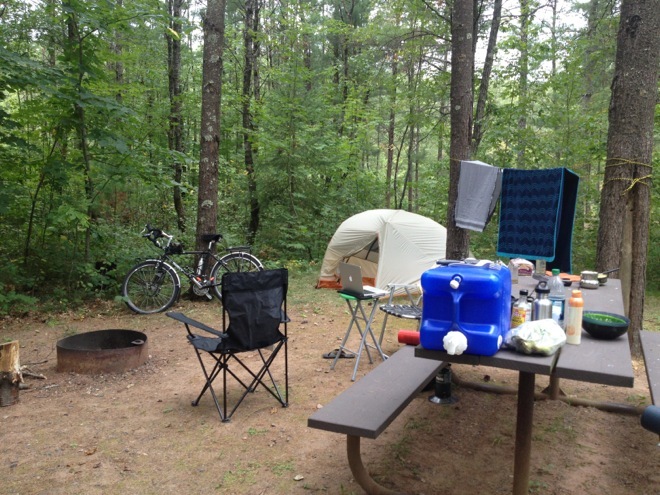 Here in Minnesota I have experienced State Forest campgrounds to be very pleasant and quite next to State Park campgrounds. The difference is the cost: $12 State Forest compare to $20 State Park. State Forest campgrounds are rustic and primitive with no flush toilets or showers. Yet, the vault toilets are suitable and I have my own solar shower that I utilize in the evenings. During the last week of July, I did a two day camping test run at William O’brien State Park on the St Croix river in Minnesota. The following week did a four night camping excursion at Lake Auburn near the town of Victoria, Minnesota. Both outings were a success, and I surely do not need much to camp comfortably according to my comfort level. On the weekdays, most state forest camp sites are void of people. At Lake Auburn, which is of the Three Rivers Park District, camping is only $12.50 and the third night during the week is free. However, on the weekends the this campsite is full. I purchased the 4G-lite jetpack from Verizon. If I can get a Verizon cell phone single I can get internet. If there is not a 4G single it will automatically revert to 3G. I am prepared up with “Power” for the electronics, hotspot internet, water storage, and a filtering system, also several other aspects which I will be sharing about living as a nomad by traveling from campsite to campsite on a budget. I will try to average $500 living this lifestyle. The longer I stay at a site the more economical. I don’t eat much, and what I do cook is inexpensive but good vegan food. While I am at a site, I do not use any gasoline unless I head into town for food. Most camp sites have water, if the water is of poor quality, I will use my water filter. I will be blogging about the gear I use, and how I camp comfortably and without carrying large coolers and such balky items.